Cookbook Countdown Specials : Bake is a baking event, which I'm co-hosting with Emily's Cooking (Makan2) Foray. This is a "spin-off" from our on-going monthly Cookbook Countdown. Cookbook Countdown Specials : Bake is for baking desserts ; pastries, cakes, cookies, pies, tarts, breads. While the monthly Cookbook Countdown is to use from one selected cookbook each month, for CC Specials : Bake, you may use any baking cookbooks of your choice, either from one single cookbook or from numerous books. The link is open from July to end September. You may link your post here. Do join us, everyone is welcome! It will be fun if you could include a picture of your Cake, Pastry and Bread book collection! Here's some of the baking cookbooks from my collection. 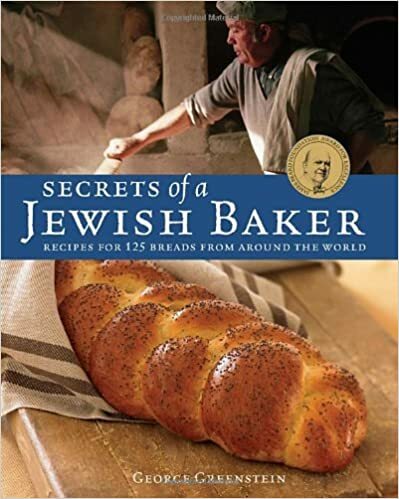 To share with Cookbook Countdown Specials : Bake, I've made a lovely bread from my recent addition to my cookbook shelf ; Secrets Of A Jewish Baker by George Greenstein. The author has given three methods of making the dough ; by hand, using the food processor, using the stand mixer. I have used the stand mixer, and made only one loaf instead of three loaves. The dough is very easy to work with. Make sure that the baking sheet is dusted really well with cornmeal, otherwise the baked loaf will stick to the sheet. Spray the top of the proofed dough with water and sprinkle with sesame seeds. Make three slashes on the loaf and bake as instructed in the recipe. Though the recipe states to bake with steam, I have forgotten to place an empty roasting pan on the floor of the oven during preheating time. When placing the dough into the oven, either toss some ice cubes into that heated pan or pour in 1 cup of boiling water, and quickly close the oven door. This will create the steam resulting lovely brown crispy crust. Since I have forgotten to preheat the empty pan, I have baked the bread without the "bake with steam". I will have to remember this the next time! A wonderful bread, with lovely crisp crust and soft tasty crumbs. This bread is fabulous as a grilled sandwich for lunch... which I will be sharing next. The recipe below is my adaptation to make one loaf of bread. (Actual recipe in the book is for making 2 loaves, either by hand or the food processor, and 3 loaves if using the stand mixer). In the mixing bowl, sprinkle the yeast over the warm water and allow a few minutes to soften. Add the flour and mix at second speed until smooth. Cover and let stand until doubled in volume (45 to 60 minutes). Stir down the sponge with one or two rotations of the beater, then add the sugar, shortening, flour and the salt. Pulse with the on/off switch until the flour is incorporated enough that it won't be thrown out of the bowl, (I suggest using the lowest speed, using the pulse switch WILL throw the flour out of the mixing bowl!). If the dough is too soft, add more flour 1/4 cup at a time. Remove and scrape down the beater and insert the dough hook. Run at first speed until the dough forms up on the hook and comes away from the sides of the bowl (10 to 12 minutes). You can use second speed for the last 2 minutes to strengthen the gluten. Transfer the dough to an oiled bowl and turn to coat. Cover and allow to rise until doubled in volume (35 to 45 minutes). Shaping : Punch down and shape into Italian-shaped loaves, about 18 inches long. (I shaped the dough into 15" long). Place the loaf on a baking sheet that has been dusted with cornmeal. Cover with a cloth and allow to rise until doubled in size (45 to 60 minutes). Brush the top with water and sprinkle with sesame seeds. When the bread had proofed, cut 3 diagonal slashes with a sharp knife or razor blade. Hold the knife at an angle to the bread and try to cut inside and underneath the crust. This will cause the bread to open, or bloom, while baking and form a thick, crunchy crust. Baking : Preheat the oven to 400F. Bake with steam (I omitted the bake with steam), until the loaves are browned and emit a hollow sound when thumped on the bottom with your fingertips (35 to 45 minutes). If baking on an oven stone or tiles, the bread can be removed from the baking pans for the last 10 minutes to firm up the crust. Nice collection of bake books! Good looking texture, looking forward to see your grilled sandwich! ps: I think I have two books from your collection, dare not click to enlarge the picture to see better cos I might be tempted to add more books to my collection! This bread look amazing Joyce, I love make bread and love you use semolina ! Joyce, your bread turned out well even without the steam bake method! Looks straight from a bakery can almost smell it. That's a beautiful loaf of bread Joyce, steam or no steam. I'll have to check this book out.